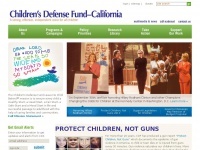 The Children's Defense Fund-California (CDF-CA) is the California office of the Children's Defense Fund, a national, non-profit child advocacy organization that has worked relentlessly for over 40 years to ensure a level playing field for all children. CDF champions policies and programs that lift children out of poverty; protect them from abuse and neglect; and ensure their access to health care and quality education. three profiles were found for Cdfca.org in social networks. Among other social networks the website is represented in Facebook, Twitter and YouTube. The web server used by Cdfca.org is run by Sungard Network Solutions and is located in Philadelphia, USA. There are many websites run by this web server. The operator uses this server for many hosting clients. In total there are at least 146 websites on this server. The language of these websites is mostly english. The webpages of Cdfca.org were developed using the programming language JSP/JAVA. The website uses the latest markup standard HTML 5. The website does not specify details about the inclusion of its content in search engines. For this reason the content will be included by search engines.